Submitted photo The term “urban forest” refers to a collection of trees and green space on the Wright-Patterson installation. This basswood tree is part of the urban forest and is native to the Midwest and a favorite tree of bees. It grows up to 80 feet tall by 40 feet wide and serves as a great shade tree in large areas. WRIGHT-PATTERSON AIR FORCE BASE — The goal of urban forest management on Wright-Patterson Air Force Base is to sustain a healthy forest while maintaining the safety of the military’s mission. “An urban forest is a collection of trees within a city, or in this case, a military installation,” said Danielle Trevino, Wright-Patt environmental specialist. “At Wright-Patt this include street trees, trees at residences, and trees in parks. Trees provide storm water mitigation, reduce energy costs, conserve water and soil, provide oxygen, improve air quality, and much more,” said Trevino. The urban forest at Wright-Patt is managed as part of routine grounds keeping and maintenance on the base. Tree management is limited to removal of hazard trees, trimming, and removal of trees to ensure safety of military operations. The 88th Civil Engineering Group conducts tree assessments annually. Trees identified for removal typically begin in the fall unless there is emanate danger to people or property. The presence of federally threatened and endangered bat species on base prohibits the removal of suitable bat roost trees prohibits cutting between April 1 and Oct. 1 to avoid incidental disturbance of roosting bats. “The removal of dead trees in areas where they do not pose a threat to people or property is avoided,” according to Trevino. “In some cases these trees provide more or as much protective habitat for wildlife as when they are alive. Many of the trees on the installation were planted in places that they eventually outgrew and then needed to be removed. A healthy urban forest begins with careful planning. It is important to take numerous factors into consideration before planting a tree. The potential mature height, the canopy spread, the growth rate and sun requirements are all factors to consider. The Natural Resources Program has an “approved tree list” with important information about each species of tree that can be planted on base. 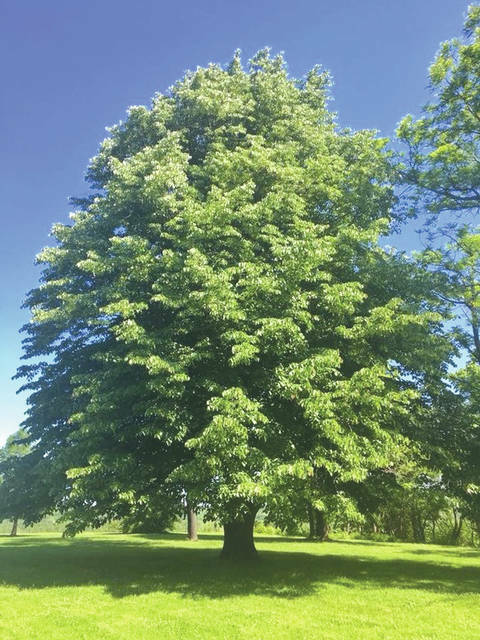 To report a potentially hazardous tree or for inquiries about Wright-Patt’s urban forest, contact Danielle Trevino at 937-257-8555.
https://www.fairborndailyherald.com/wp-content/uploads/sites/50/2018/09/web1_180824-F-VS170-1001.jpgSubmitted photo The term “urban forest” refers to a collection of trees and green space on the Wright-Patterson installation. This basswood tree is part of the urban forest and is native to the Midwest and a favorite tree of bees. It grows up to 80 feet tall by 40 feet wide and serves as a great shade tree in large areas.